Do you pay attention to the ingredients that are in your dog's treats? How about the process that goes into the making of dog treats? Some of the things that we like to see in dog treats are natural, organic, ingredients. It's also nice to know how the dog treats we try are made. 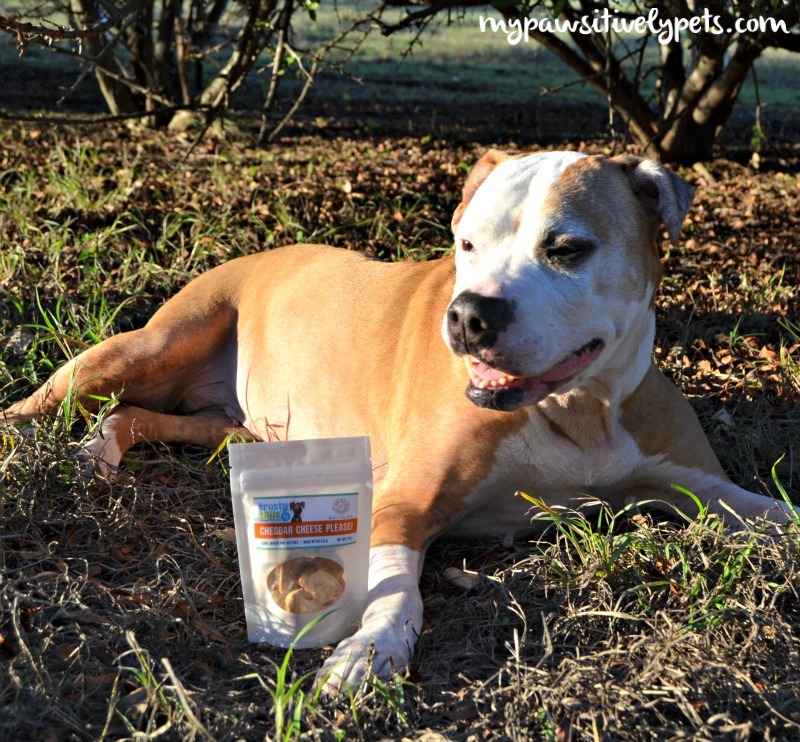 If you are an ingredient conscious dog parent, we'd like to introduce you to a new line of healthy dog treats from Trusty Tails Treat Kitchen. Shiner has been sampling these treats for a couple of weeks. 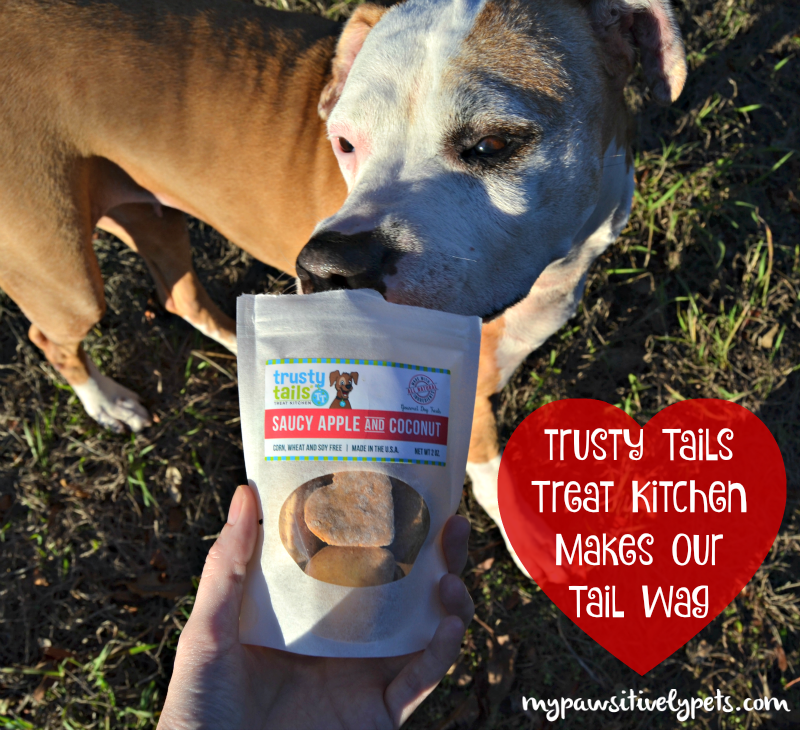 Trusty Tails Treat Kitchen makes her tail wag! This post is sponsored by Trusty Tails. We are being compensated to help spread the word about Trusty Tails Treat Kitchen, but Pawsitively Pets only shares information we feel is relevant to our readers. Trusty Tails is not responsible for the content of this article. Trusty Tails Pet Care was founded in 2006 by Heather Gaida. Heather started her own dog walking and pet sitting business in Hoboken, New Jersey back then. Now, Trusty Tails Treat Kitchen provides delicious high-quality baked goods for dogs. Their treats are hand-made and oven-baked in small batches in Montville, NJ, making them 100% made in the U.S.A.
Shiner sampled all three flavors and enjoyed them. The treats are a nice size and crunchy. They smell delicious too! The Trusty Tails Treat Kitchen website says these treats are human grade dog treats, so a human could eat them if they wanted to. 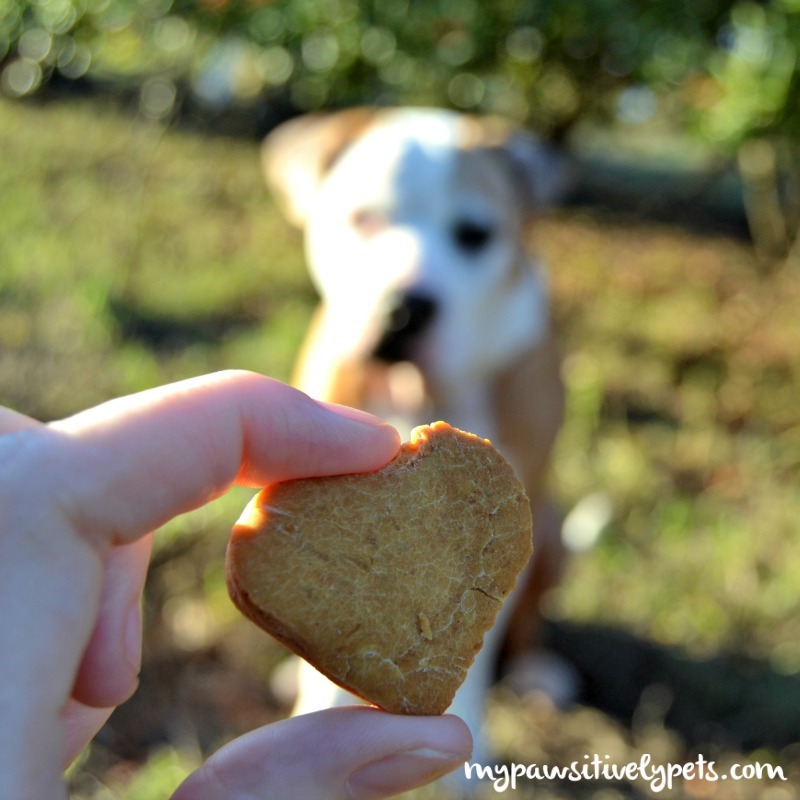 Shiner wanted the treats all to herself and tried to run off with the bags multiple times during our photo session. Don't be fooled by that sweet, adorable, innocent-looking face. I had to wrestle her and play tug-of-war to get the bag of treats back! I guess it's safe to say that they are a hit with her. 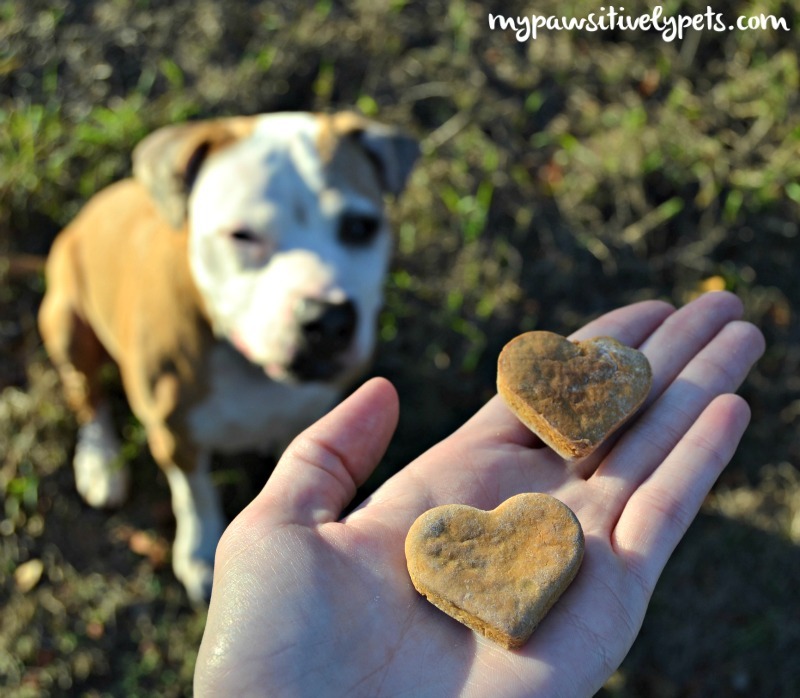 As you can see, there are a lot of reasons to love Trusty Tails Treat Kitchen dog treats. 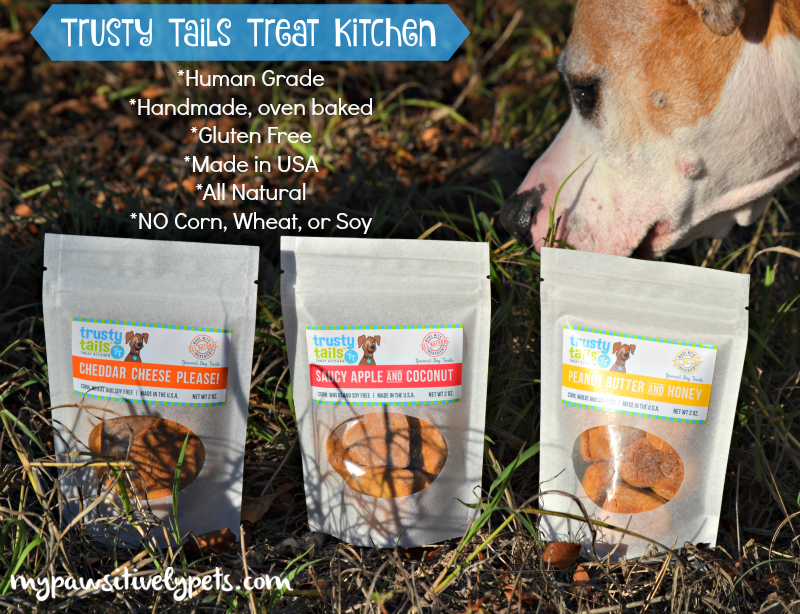 Trusty Tails Treat Kitchen packages their treats in convenient to carry bags. They are small enough to fit in your jacket pocket, small purse, bag, or even stockings (Yes - the Holidays are on their way). The bags close easily with a zip lock closure. To make things convenient, you can join the Trusty Tails Treat Kitchen Club and have a supply of healthy dog treats shipped to your door each month. This way, your dog's treat jar will never be empty! If you like feeding your dog healthy and high quality dog treats, we recommend giving Trusty Tails a try. Shiner gives them 4 paws up! To stay up to date with Trusty Tails Treat Kitchen you can follow them on Facebook and Twitter. Which flavor of Trusty Tails Treat Kitchen dog treats would your dog most like to try? I bet the apple coconut ones would be good! Apple and coconut is such an interesting combination and healthy too. Today's dogs have a sophisticated pallet. They look tasty and I've never heard of them before - thanks for sharing! These treats sound great, and I love the flavor choices! Shiner is too cute and great review!